It’s finally Halloween. In keeping with the spirit of the season, NPR recently ran a story on ghosts. I’ve posted on the topic of ghosts several times since they are inherently a religious phenomenon, whether they actually exist or not. Empirical method only takes us as far as that terminal border, but not beyond. 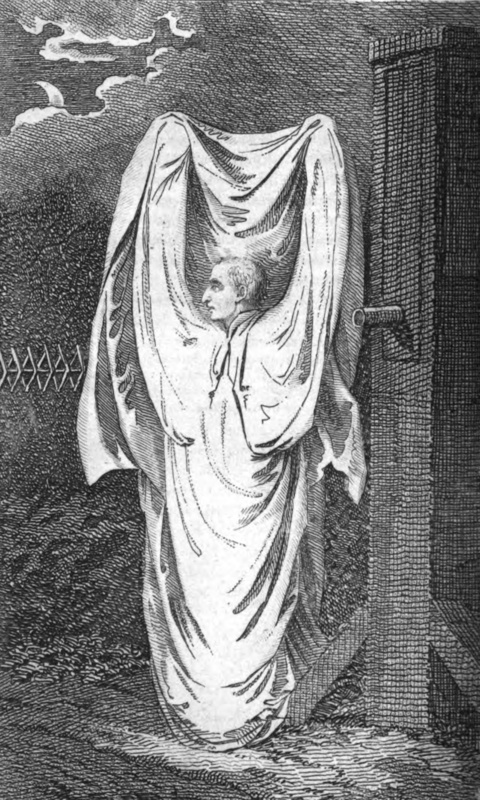 Since we all face death, the question of ghosts is intriguing to many people. In some parts of the world, according to the NPR story, up to about 90 percent of the population believes in ghosts. 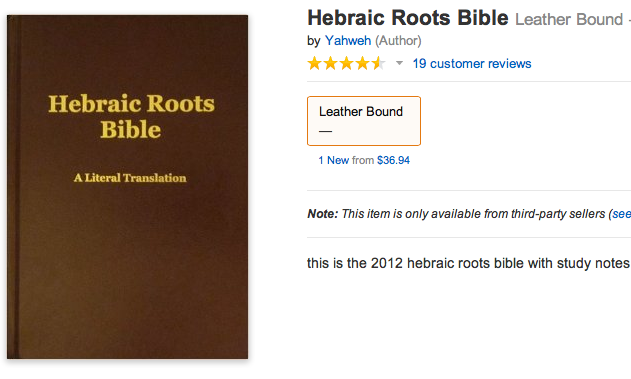 They have been part of the religious thought of humanity since writing began. Ghosts have haunted us from earliest memory. What makes the NPR story so interesting is that there is a kind of moral consciousness that runs through the story. An interview with Tok Thompson, an anthropologist at the University of Southern California, makes up part of the story. Thompson notes that ghost stories often concern unresolved justice issues. He cites the overused “Indian burial ground” motif as an example—where there is a collective guilt, ghosts tend to gather. Slavery is another such social injustice, and again, ghosts and slaves are no strangers. Christianity tended to push justice off into the afterlife. The fact is many people do not receive fair treatment in their lives. Some of them are very good folk who just never get a fair chance. That troubled early Christian thinkers into making Heaven into a place where the reward came. It also, unsuccessfully, tried to suppress the idea of ghosts. Ghosts problematize such easy theology. What are they still doing here when Heaven, Hell, or Purgatory should suffice? The NPR story even addresses the idea of possessed dolls. Tok Thompson notes that the word “doll” derives from the word “idol.” This sheds a whole new light on Barbie, I suppose. An idol is an image representing a deity. In the Judeo-Christian tradition religious statuary was problematic at first. Again, Christianity bucked the trend by allowing images because people naturally want to see what it is they believe. Stories of haunted dolls and statues and other inanimate devices are difficult to accept. They are, however, deeply religious. That’s because ghosts represent what we really believe. Death is the most parsimonious of thresholds. We can’t look over at the other side, but, if ghosts exist, they may give us a glimpse beyond human sight. And that seems like an awful decent thing to do. 75 years ago today Orson Welles presented a radio drama version of The War of the Worlds. Perhaps it was the looming fear of the Second World War in a society that hadn’t yet overcome the trauma of the First, or perhaps too few people had read H. G. Wells’ novel, but the result was surprisingly catastrophic. Panic arose as listeners supposed that the invasion was real—the broadcast, although announced as a radio drama, followed a news bulletin format that overrode the rational faculties of many. This episode would influence government decisions about what to reveal to the public for years. And, naturally, it all began in New Jersey. 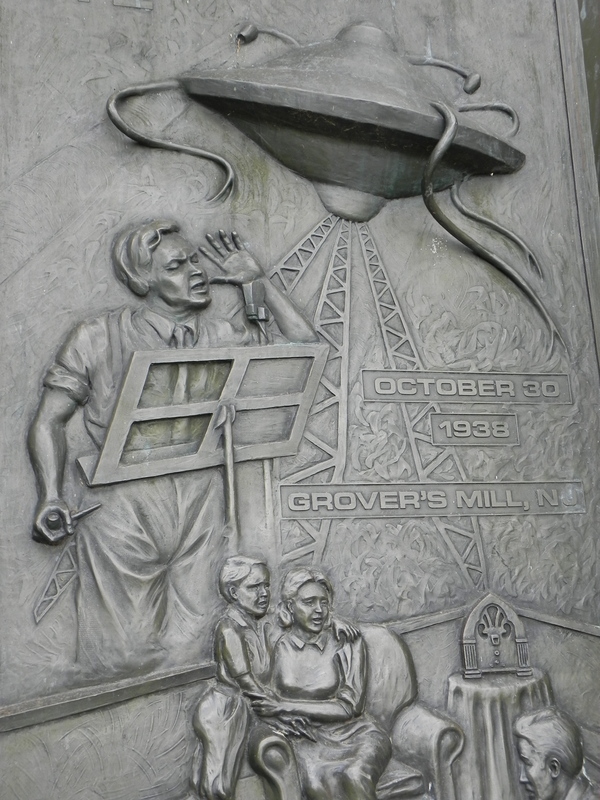 Unlike the novel, the radio broadcast set the invasion, initially, in Grover’s Mill, New Jersey. This tiny town is difficult to locate even today, falling as it does between the busy north-south roadways that run through the central part of the state. The Hindenburg disaster had taken place the previous year in Lakehurst, New Jersey. Welles, impressed by the radio coverage of that celestial fear, used those broadcasts as models for his play. A few weeks ago I ventured to Grover’s Mill to let my imagination roam free for a while. A great deal of history may have been determined by that broadcast and the public reaction. We are ready to believe that danger lurks above. The First World War began to make early use of the airplane as a weapon. The sky, previously, had been obtainable only with the slowly moving balloon. Only eleven years earlier Charles Lindbergh had crossed the Atlantic by plane for the first time. The Second World War would see air combat as a major component of victory, also for the first time. My mother grew up in New Jersey, watching planes searching for German U-boats off the shore. The skies were not so friendly then. 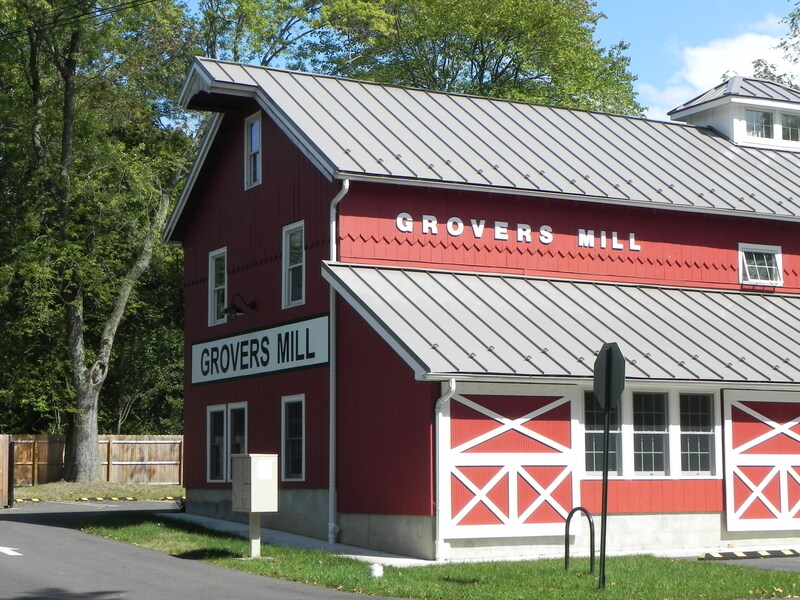 As I stood in Grover’s Mill, I recollected an unpublished book I once wrote about the weather in the book of Psalms. The thesis, somewhat loosely, suggested that for the average person the sky reflects the mood of the divine. Dramatic clouds still look angry, even when God is removed from the equation. The Reagan era gave us all new things to fear raining down on us from the skies. September 11, 2001, brought the skies crashing to the earth again. Invasion from above is an apt way to add a chill to Halloween, for it takes the prerogative of the deity and makes it either human or alien. At least most people who believe in God think he’s on their side. When the Wright brothers took their heavier-than-air craft briefly to the skies in 1903, The War of the Worlds had only been on the market for five years. The coming decades would drive God from the skies and we would come to learn that what falls from above would no longer have our best interests at heart. Vampires are on my mind. The funny thing is this often is the case when I’m unemployed. 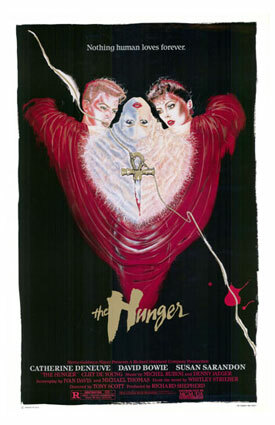 Feeling lost and alone, I settled down to watch the most depressing vampire movie I know, The Hunger. Miriam Blaylock, an unaging vampire, has made her way through history by taking lovers with the promise of eternal life. As she makes her lovers vampires, they survive centuries as young people, but then suddenly age and die within days. Terribly artistic (how could it not be with David Bowie as the male lead? ), the film has a very heavy atmosphere and a calculating coldness as Miriam promises her lovers that they will live forever, knowing that once the aging begins, their decaying corpses will continue to live, weak, hungry, and wanting to die. I did say that it was depressing, right? The vampire, besides feeding off the essence of others, is concerned with eternal life. Religious symbols do not affect Blaylock and her ilk—in fact, they wear knives hidden within ankhs to stab their victims. The ankh, the Egyptian sign of eternal life, is the means of death. The only way to live forever is to feed off others. Like many of those who pay attention to society, I have been fascinated by the enduring power of the vampire. When I was a child watching Dark Shadows on TV after school, I supposed vampires were things kids were interested in—the adults I knew had other things on their minds. As my generation grew, however, the vampire grew along with us. We had Interview with a Vampire, Lost Boys, Buffy the Vampire Slayer, Blade, Underworld, the Twilight series, I am Legend, Van Helsing, Priest, the Vampire Diaries, and on and on and on. Why are we so fascinated with a mythological creature? The vampire is profoundly religious and deeply symbolic. Evolution endows us all with a will to survive, the desire, if you will, of eternal life. The vampire is the symbol of that hope with no constraints. We are taught, and some of us even believe, that other people have the same rights as we do. The vampire’s urges, however, overwhelm even personal conviction and we are all potential victims. Vampirism may be the ultimate symbol of our society. When future historians look back on the late twentieth and then the twenty-first century, won’t they see a world of profoundly deep inequality? Won’t they see multiple millions being sucked dry by the reassuring words that they are “middle class”? In The Hunger, daylight, crosses and mirrors do not dissuade the undead. Miriam needs her lovers, even though it will mean an agonizing unending end for them. Promises are made, and, when broken, the lovers are too weak to fight back. And her wealth increases with every generation. I lost my job at a very profitable company. Those who remain, on top, do not suffer fear of want. I look at Miriam Blaylock and wonder what it must be like to think that way. Perhaps out of a warped—perverse even—sense of self-punishment, I watched The Omega Man. Being unemployed will make you react that way. I have a pretty high tolerance for theatrical assault, as my regular readers will know. For those of you with less self-destructive penchants, The Omega Man was the second cinematic adaptation of Richard Matheson’s novel, I Am Legend. The first movie version, The Last Man on Earth, was released in 1964, starring Vincent Price. The most recent version, borrowing the novel’s name and starring Will Smith, is the third and best attempt so far. In any case, The Omega Man opens with Charlton Heston thinking he’s the last man alive, and even that doesn’t stop him from taking his shirt off at every opportunity. That I could tolerate, however, had the movie not strayed from what I thought was its central premise—that Robert Neville was alone with a city full of vampires. Although Vincent Price did not, uncharacteristically, make a convincing last man alive, the earliest version at least retained the vampires. 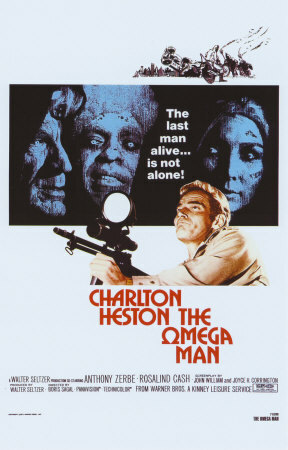 The Omega Man, perhaps in the spirit of 1971, substituted them for religious fanatics. The substitution didn’t bother me so much, but the religious fanatics were pathetically acted. Leibowitzian, anti-progress monks, hating the science that led to the nuclear holocaust that made them photophobic night dwellers, they snack on sardines and graham crackers, but only come out at night to kill scientists. Well, only one, since Neville seems to be, uh, the last man on earth. They accuse him of making the wheel and using technology as they run around in off-the-rack children’s Halloween costumes acting otherwise infantile while Heston strikes dramatic poses, grimacing with a variety of machine guns in hand, as he simply shoots them. That’s not the way the world’s supposed to end. The vampires have become a religious society doing everything short of handing out tracts on the corner. Well, maybe it is the end of the world after all. It is difficult to portray loneliness effectively. Those of us who’ve been there know it intimately, and somehow Charlton Heston has too much fun with it. Even Vincent Price had trouble making it look convincing (I mean, who still uses a saucer when having their coffee and wears a tie after the apocalypse?). Will Smith at least showed a man occasionally breaking down in tears. Charlton Heston doesn’t cry. And he doesn’t shy away from god-like delusions. When he finds the other survivors (or they find him), we learn that Neville has been attempting to cure the religion virus. Dutch says, “Christ, you could save the world.” Neville doesn’t deny the obvious messianization of his mission. In fact, pseudo-crucified on a piece of modern art, Neville receives a spear-thrust to the chest, and dies in cruciform posture in a pool of his own blood. His blood that has the antibodies to save the world. Sound familiar? For all the blood, the vampires are gone. And when I feel that the world is against me, I want to see vampires. I’m thinking about how we blithely accept cruelty and christen it “just business.” It’s legal, and even encouraged. Was a time when you wouldn’t dare trade with a stranger because he might cheat you. To make a deal implied a relationship. To get away with something unseemly you had to be able to look someone in the eye and take advantage of her or him anyway. Oh, we’ve sanitized it alright. Most workers never meet the CEO. His hand doesn’t even deign to sign the paycheck. The workers are forced to trust nevertheless. Don’t worry, it’s just business. Or is it? The system, of course, favors those with the loudest voices, and those voices speak the language of Mammon. We don’t dare upset the order, believing we will get ours some day. Delusion is so sweet. 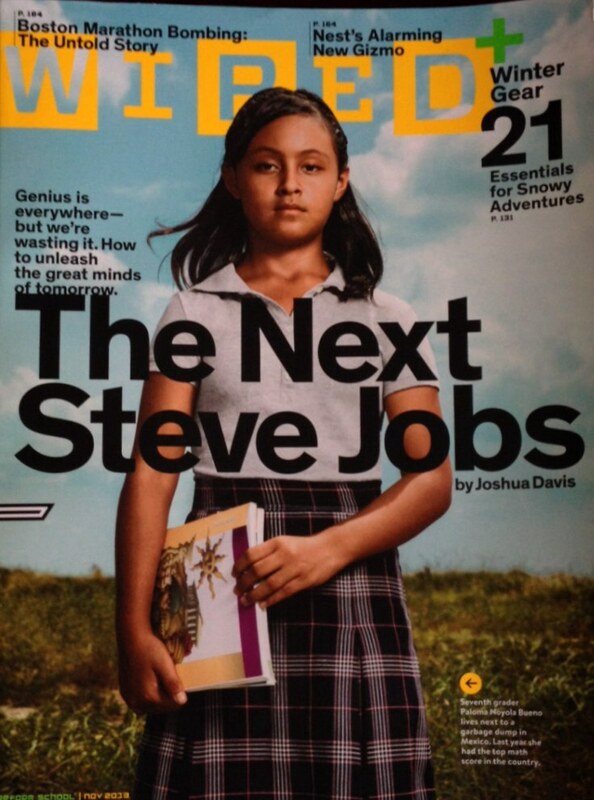 On the cover of Wired magazine is a little girl. The caption reads, “Genius is everywhere—but we’re wasting it… Seventh grader Paloma Noyola Bueno lives next to a garbage dump in Mexico. Last year she had the top math score in the country.” Careful, Wired, you’re beginning to sound socialist. Bueno was on the cover of a major magazine because she was discovered. Those who remain hidden far outnumber those who claim far more than their share of capital. You don’t make it to the top unless you crawl over the other caterpillars. When you reach the top, as Trina Paulus sagely warned, you find there’s nothing there. Just human detritus beneath your feet. Business has come to mean “cold and impersonal.” Keep the human element out of it. In fact, the term “just business” is a very effective shield against all kinds of unethical behavior. And it is the model on which we shape our society. Is it any wonder that the economy takes such precipitous tumbles? Funnily enough, those who support “business ethics” such as these most vehemently also claim the title “conservative Christian.” Unless Christianity has thrown its moral compass into the sea, there’s no legitimate way to claim the latter half of that moniker. We praise and wonder at our Einsteins. How many of them died in the gas chambers and ovens of the Nazi regime? How many of them have starved in Africa? How many never rose above the crippling poverty of Mexico? Perhaps it is time we as a society demanded a stop to the wastage. “Waste not, want not,” should be our mantra. And if those at the top can’t show what they’ve done to help their fellow human resources, perhaps they should live next to the garbage dump. Don’t take it personally, one percenters, it’s just good business. A moveable feast is hard to hit. Or something like that. Religious festivals are frequently tied to celestial events—the ancient Jewish holidays are based on a lunar calendar which, we all know, is out of synch with the solar one. This is the reason that for Christians Easter migrates around the spring calendar, even if different branches of Christianity peg the resurrection on various dates. Curiously, no one has suggested going back to c. 33 C.E., fixing the date of Passover that year, and giving a calendrical date for Easter. It sure would make planning a lot easier. In any case, a week or so ago there was a flurry of lighthearted commentary on “Thanksgivukkah,” the fact that Hanukkah and Thanksgiving occur at the same time this year. Both are moving feasts, and they just happened to bump into each other this year. 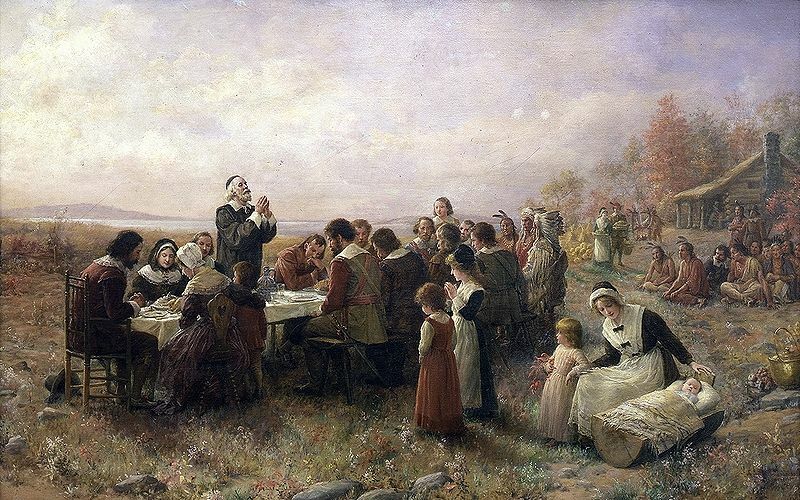 Thanksgiving is a modern holiday, emerging with the Protestant penchant for giving thanks for surviving in a harsh, new world. The United States government (which was not shut down at the time) finally regularized the date of the holiday to the fourth Thursday in November, giving the commercial world it’s only regular 4-day weekend. Christmas, not a moveable feast, cycles around the days of the week, giving employers a great sense of glee when it falls on a weekend so that employees may be given only a token Friday or Monday off. The day after Thanksgiving, however, is thankspending, as American a holiday as one can conceive. Hanukkah is also a roving feast. Celebrating the cleansing of the temple in Jerusalem after being defiled by the Seleucids, it has taken on many of the trappings of Christmas over the years, but it can come as early as late November, as Thanksgivukkah demonstrates. Holidays, in this secular world, have come to represent something for which the Sabbath originally stood. The idea was that people needed a break from work. Despite all the studies that show more breaks make people more productive, our culture glorifies the over-worker. The reason, clearly, is not productivity, but control. I recall a lawyer once drawing a large circle on a newsprint pad and telling me, “this represents what your employer can do to you.” He drew a tiny circle in the middle of the large one and said, “and this is what your employer can do to you that is considered illegal.” Yes, we are a society that has never really gotten over the idea of indentured servitude. Little things like holidays overlapping keep us amused, while still at our desks. Hanukkah lasts for eight days. Christmas for twelve. But don’t try to take all that off—you might like coming back to work refreshed a little too much. Instead, why don’t you try making those bricks by finding your own straw? Everyone will benefit from this pyramid scheme.